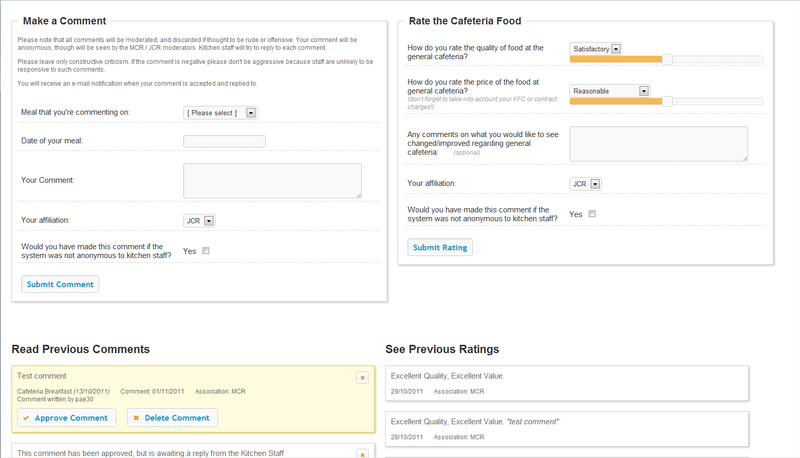 My college, Trinity Hall, was recently in need of a new system to allow students and staff to comment on Hall food. As I couldn’t find anything that specifically met our need, I put together a standalone package. jQuery UI and jQuery Validate plugin. SCR, MCR and JCR each have their own moderators. These can be updated through the web interface. Optional lists of SCR, MCR and JCR members can be filled, and the system closed to anyone not on those lists. These lists can also be updated through the web interface. I have released the package with a GNU General Public License, meaning that anyone is free to use and modify the code as they need (though please leave the licence and credit in place). Cambridge colleges can easily use the system, hosted on the SRCF. Alternatively, you can download the comments package.